Los Angeles (AP) – There’s an oppressive bleakness to the brutal action-thriller “Sicario: Day of the Soldado.” But with faces like Josh Brolin and Benicio del Toro, what are you going to do? 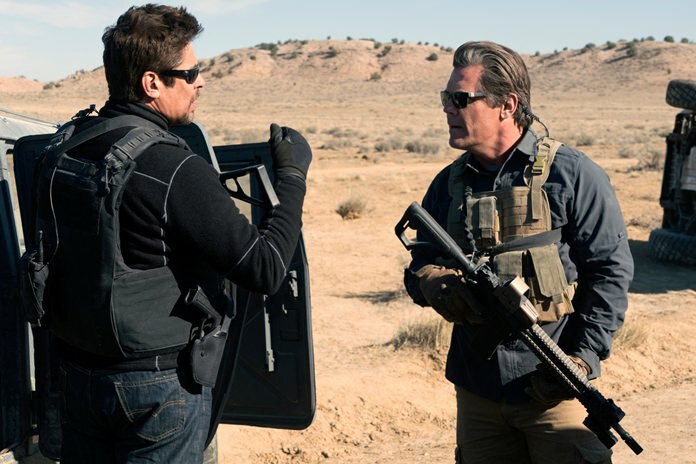 Amid the dust cloud of violence that settles over the “Sicario” sequel, nothing stands out like the furrowed brow of Brolin’s grimace or the cold, worn-out stare of del Toro. They look like gunslingers from an Anthony Mann or Sam Peckinpah western, just with heavier ammo and dark sunglasses. With such sunken, world-weary eyes, in the heyday of film noir del Toro and Brolin would have made a killing. They do plenty of that, too, in “Sicario: Day of the Soldado.” Matt Graver (Brolin) and his cartel lawyer turned undercover pal Alejandro Gillick (del Toro) are again called into action in a black-ops operation along the Mexico border, this time without the benefit of Emily Blunt, who starred in Denis Villeneuve’s “Sicario” (2015). Blunt played a less experienced FBI agent with the naivety to be horrified by things that Graver and Gillick wouldn’t bat an eye at — you know, sissy stuff like dozens of decaying corpses stuffed like insulation into a Mexican cartel safe house. No, Graver and just-as-grave Gillick have seen it all. And Blunt’s absence leaves “Day of Soldado” without the mounting sense of dread that defined the first one. It also lacks the muscular camera work of Villeneuve and cinematographer Roger Deakins. With such missing talent, it would be easy to view “Day of the Soldado” as a cheaper knockoff. Easier, still, considering the movie’s poster — of a gun-toting skeleton draped in a flag — most resembles a Guns N’ Roses album cover. It’s better than that, but not by much. Stefano Sollima (“Gomorrah”) steps in to direct a script by Taylor Sheridan, whose neo-westerns (“Hell or High Water,” ‘’Wind River”) have made him the genre’s best new hope. Sheridan wrote “Sicario,” too, which sought to modernize the drug-war thriller to catch it up to the lethal battles of today’s cartels. But in its ballet of SUVS sweeping across the border, “Sicario” mostly stood for a ruthless, borderless American power equaling the ultra-violence of a new era, with all the moral doubt that accompanies such a fight. “Day of the Soldado” begins with a similar stab at political relevance. A supermarket in Kansas City is attacked by a swarm of suicide bombers, the last of whom we watch detonate his vest just as a mother and child are trying to tiptoe past. Sheridan and Sollima could easily defend the imagery: This is indeed a not uncommon happening. But it’s a sensationalist way to show it. Is there anyone left who doesn’t understand the horror of terrorism? It’s believed the bombers were jihadis who infiltrated the country by slipping through the Mexican border. Told that the cartels control the trafficking of migrants over the border, the Secretary of Defense (Matthew Modine) opts to clandestinely prompt a war between two cartels. Graver’s plan is to kidnap the 12-year-old daughter of a cartel kingpin to kick-start the war. “There are no rules this time,” Graver tells Gillick, even if it’s unclear how much Graver ever heeded the rules in the first place. Where “Day of the Soldado” most succeeds is in the blur or maybe altogether disintegration of American altruism in a heinous fight. In one scene, Gillick switches from kidnapper to DEA agent by unhurriedly slipping on a government jacket, but not changing gun or even his seat. Things go from dark to darker still, as “Day of the Soldado” sets its genre tale against the backdrop of Mexican migrants in a way that sometimes feels topical and sometimes exploitive. As grim as the world of “Sicario” is — and Sollima and Sheridan really wants us to know just how grim it is — there’s also a sentimental stab at redemption by way of the kingpin daughter (played by a very good Isabela Moner), who ends up in a desert trek with Gillick. “Sicario: Day of Soldado,” a Sony Pictures release, is rated R by the Motion Picture Association of America for “strong violence, bloody images, and language.” Running time: 123 minutes. Two and a half stars out of four.